← Intrinsic and Extrinsic Motivation – why do they work against each other and which works better? Can you be Trusted before you can prove it? In Australia we live in what I call a ‘high trust’ society. We tend to take people at their word. 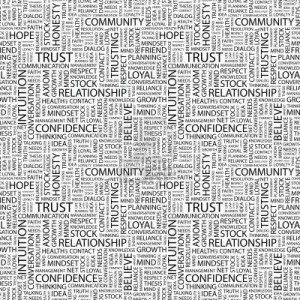 What Words Are You Using To Build Trust? You could say “I am an airline pilot with QANTAS” and most people will accept what you say immediately. In fact you could make almost anything up! This model will, of course, fail immediately if the person you are talking with says “I am too, which route do you fly?” or if they know someone in the room who is also a pilot. The lesson here is, in Australia and many ‘Western’ countries people tend to trust first and ask questions later. In most of the world, however, business is transacted in a low trust environment where trust must be earned, sometimes with every call you make. If I want someone to make a buying decision with me I need them to trust that what I say will happen when they buy my product or service. The bigger the decision the larger the level of trust required. I was talking with an older person just listening to their stories. After awhile, out of the blue, she said “Greg, you are a good boy”. I was so surprised I said “Why don’t you put that in writing”, which she did. I now have a signed piece of paper which I treasure stating ‘Greg is a good boy’. Getting to the point where someone thinks you are a good person is just a matter of listening and asking open, reflecting and probing questions. The fact you take the time to listen tells the other person you are someone they can trust. A fellow business coach asked for a minute of time to discuss a client of theirs they were having trouble with. At the end of this discussion she said “Greg, you always have great ideas. Do you mind if I use you on an ongoing basis?” All I had done was listen to the problem and reflected ideas back in the same format as she stated them. “The person I am coaching has achieved all the goals we set out to achieve. I do not know where to go from here” she said. “Have you reset the goals in light of the way the person has developed?” I asked. What I did was reflect back her words in a new way. While this was not rocket science, it did give her an ‘ah-ha moment’ and cemented in her mind that I have good ideas and moved me to the next level of trust. “You can change all that COBOL into JAVA using an automated tool?” one incredulous programmer asked me. I could see this multi-million dollar project was going nowhere despite the level of trust we had developed. I asked, “John, if I can show you this working will you authorise a pilot program?”. What John wanted was evidence for himself and others of his team I was a trustworthy person. We setup the demonstration and won the pilot program. They believed because we showed we could do what we promised on a small scale, then a large scale. When you meet someone for the first time you automatically open a ‘trust bank account’ with a small, but positive, balance. Every time you promise to deliver a result (to get more, to save more, to look good, to feel good, to eliminate pain, or to be loved) and you do it, you add to your trust bank account. Every time you fail you make a withdrawal. Can you be trusted before you can prove it? Yes, in most situations people will take you at face value. When it comes to decision that will impact their business or life you can be sure it will only be made when you trust bank balance is substantial. This week, when you meet with your clients ask this simple question; “How could purchasing this product or service change the way you do business?” you may be surprised by the answer. What are you doing to make deposits into you trust bank account? Every time you make a promise, no matter how small, if you do not deliver it counts as a withdrawal. Send an unexpected handwritten card or thank-you note and you add to your trust account. Nothing will establish trust and increase sales better than becoming an expert in asking the right questions, following up with ideas and showing how these ideas work with other organisations Email me to setup a time to talk about opening a trust account with your team. This entry was posted in Monday Motivational Minute and tagged questions, sales, trust. Bookmark the permalink.